One of my foodie friends, Lisa of Authentic Suburban Gourmet, makes some mean crostini. She never seems to run out of topping ideas for these little toasts, sweet or savory or for any occasion. Imagine my delight when she announced me the winner of her Crostini Challenge, thanks to adorable Max! It was quite a treat to receive a beautiful bruschetta/crostini book for my prize, especially when you have a cookbook obsession like I do. I couldn’t wait to give the book a test run! 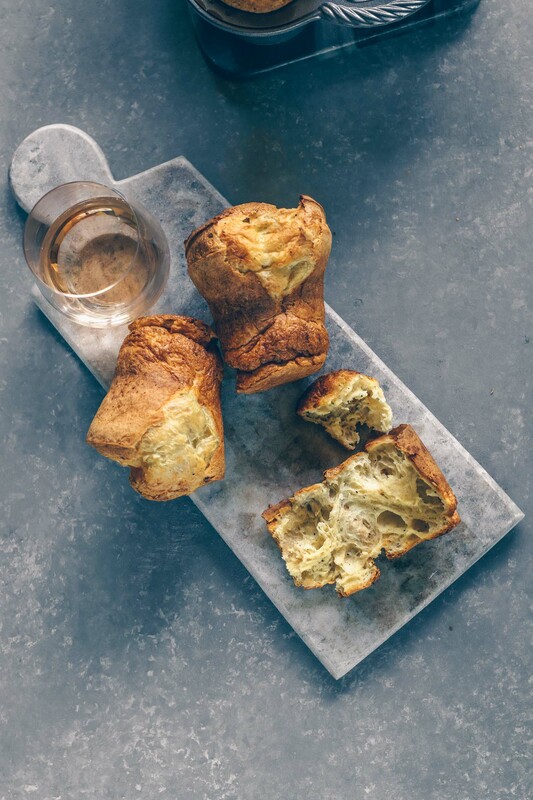 Selecting a recipe from the book was very easy; a few pages in I came across a bruschetta showcasing two ingredients that I already had waiting to be enjoyed. My tomato plants were loaded with ripe, bright red jewels and I had a tray of fresh French feta in the fridge. Perfect! Normally, I save the effort of roasting tomatoes for the store-bought Roma variety. These often flavorless grocery store regulars get an extreme makeover with some oven TLC and turn into super sweet beauties. My cherry tomatoes were already sweet but since I was such a cooking maniac coming home from vacation (and the recipe called for some slow roasting), I thought it wouldn’t hurt. I was a very happy girl after taking a bite of the assembled bruschetta. 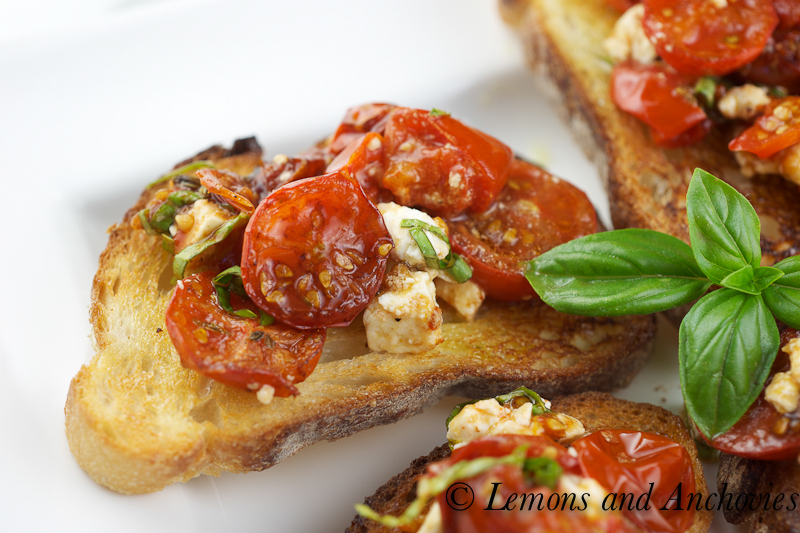 The sweet tomatoes, feta cheese and fresh basil were like a bite from heaven on top of the olive oil-drizzled and garlic-rubbed toast. I’m normally very happy with the traditional topping of fresh chopped tomatoes on bruschetta but these were especially tasty. I did put my own spin on the tomatoes by roasting them with balsamic vinegar, thyme and garlic but I’d say that the feta cheese and basil elevated this to new heights. These were gone in no time! Thanks again, Lisa, for a wonderful prize! I can’t wait to try more recipes from my new book. Preheat oven to 325ºF. 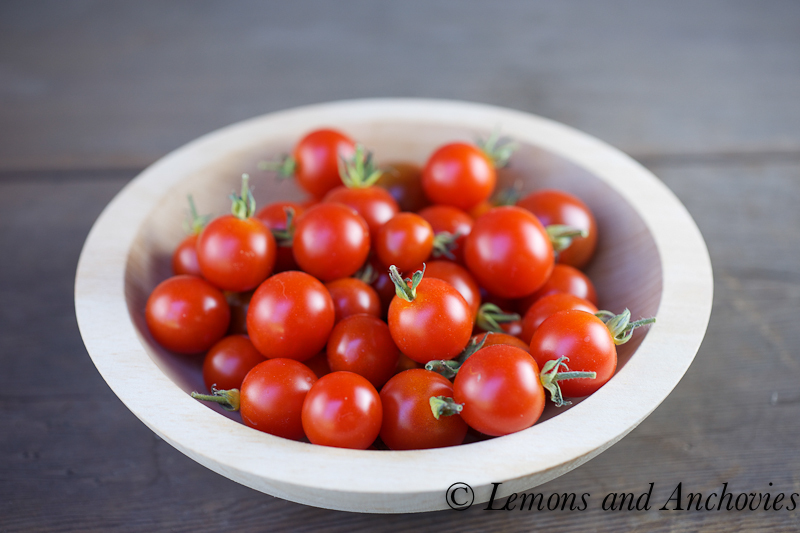 Cut tomatoes in half (lengthwise for plum tomatoes and crosswise for cherry). Combine the marinade ingredients: garlic, herbs, olive oil, salt, pepper and balsamic vinegar. Toss tomatoes in the mixture and spread on a baking sheet. If you’re using plum tomatoes, lay them cut side up on the baking sheet and bake for two hours. If you use cherry tomatoes like I did, 15-20 minutes in the oven will be sufficient. The goal is to warm up the tomatoes and caramelize the balsamic vinegar. When finished, toss the roasted tomatoes with feta, basil and a drizzle of balsamic vinegar. To make the bruschetta, grill or toast the bread on both sides. I used my broiler for this. You just have to watch them closely. Rub the top side of each toast with the the fresh garlic, top with the tomato/feta/basil mixture and drizzle with additional olive oil. Serve immediately. How wonderful; and the thought of needing only 20 minutes of oven time to roast these cherry tomatoes to their caramelized goodness is perfect! Yes, any more time in the oven and they would have disappeared. The balsamic vinegar helps a lot! Thanks! Jean – those look divine!!! I am SO happy that you are enjoying the book – it is one of my favorites. Max appreciates the shout out. 🙂 Great photos and I bet you enjoyed those little crostinis. I think I will have to make these over the weekend – can just imagine them with a nice cold Sauvignon Blanc and sitting outside in the warm weather. Have a terrific rest of the week. Thanks, Lisa. So happy that I won this book from your giveaway. I’ve already marked a few other recipes to try. They all look so good! 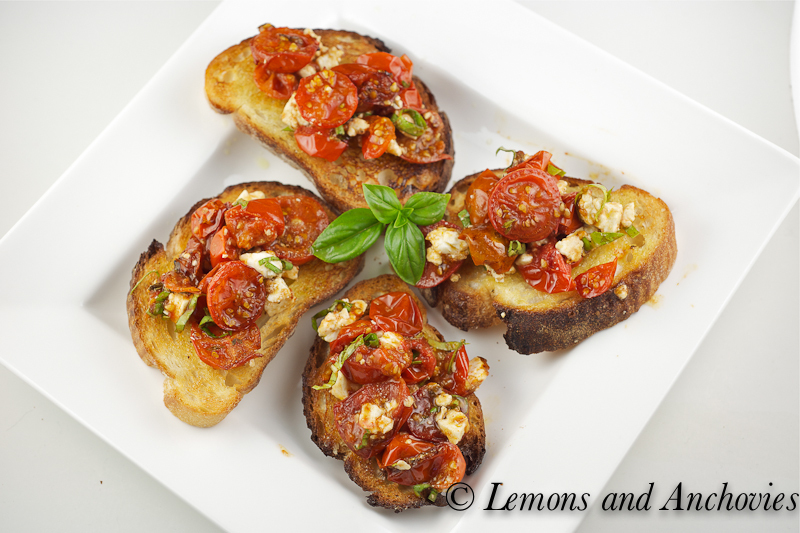 Just gorgeous – love toppings for bruschetta – it’s a staple in my house. Don’t you love how intense the flavor is when you roast the tomatoes? Evan, it makes me happy that you’ve tried my recipes. So cool, thanks! I loved this dish, I live in Italy and since I came here can’t stop eating BRUSCHETTA!! Yumm, I need to try these. 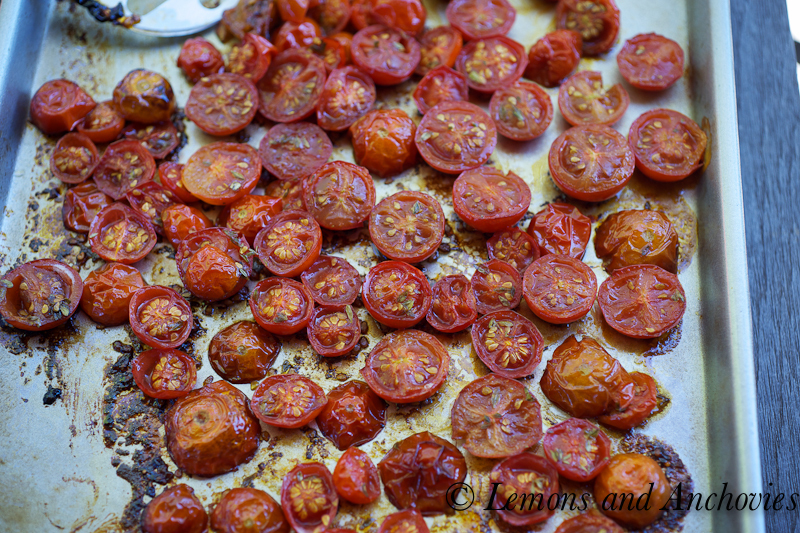 I love roasting the tomatoes, great recipe, thanks for sharing! I totally understand the cookbook obsession!! Beautiful pics, my favorite is the shot of the roasted tomatoes on the pan. I have never made bruschetta, but always love it when I go out. I think really need to try it myself! I think bruschetta will remain one of my favorite appetizers for the rest of my life. I especially like how the tomatoes are roasted in this recipe (I love doing this because I think it imparts so much flavor!) Thank you for sharing! Thanks, Monet! Yes, roasting gives tomatoes a huge flavor boost. It’s great! 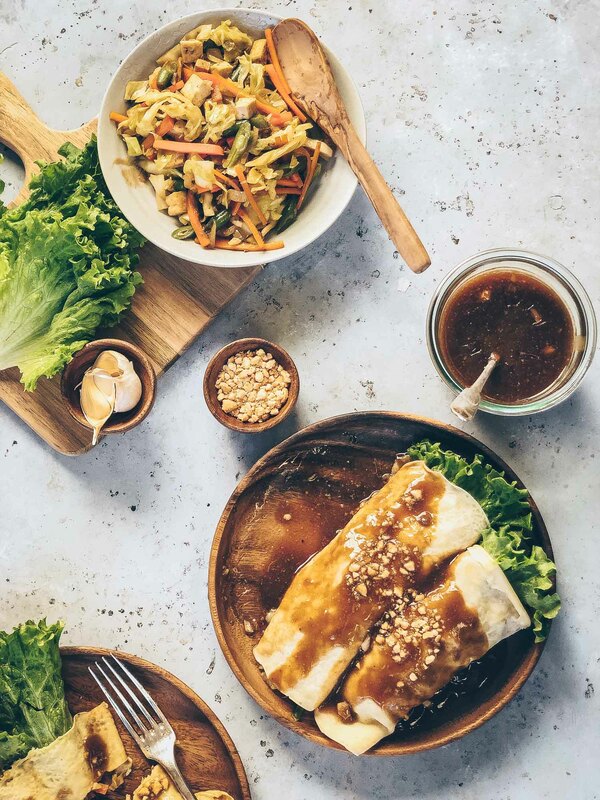 Pictures are gorgeous and really making me hungry. The cherry tomatoes look so plump and juicy. I love those roasted little beauties! This looks amazing! 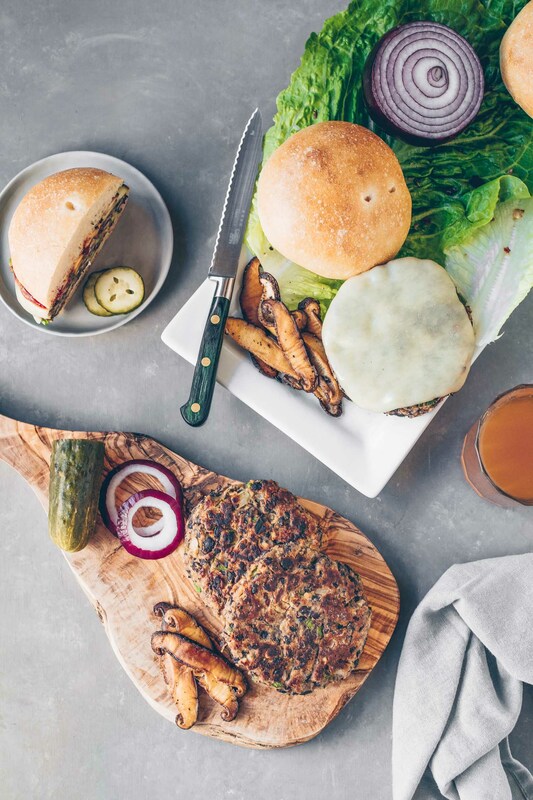 gorgeous pictures and great write up–you know how some recipes just call to you when you think of them? This is one of those. I think I could eat these for every meal. Just beautiful! Yum! So good for summer. I just made bruschetta with mushrooms, spinach and gruyere! I am going to try this next…. Yum, your version sounds good, too! Your bruschetta screams summer and is begging for a dinner party! Lovely! So glad you’re enjoying Lisa’s giveaway! Thanks, Liren! I did end up making these for a dinner plus another new recipe. Will post the second one soon! p.s. congrats on winning the giveaway-that’s always nice (smile)! Thanks, Stella. 🙂 Roasted tomatoes are good on so many things! Hmmm that bruschetta is mouthwatering, I think there’s nothing more satisfying than toasted slices of baguettes, topped with roasted tomatoes and olive oil. Lucky you to have those beautiful tomatoes in your garden. Mine are still green, simply because I am a bad gardener! Love the pic of the tomatoes in the plate just waiting to be eaten! What a colorful dish! Love the presentation. Your pictures are really gorgeous – especially the bowl of little tomatoes and the roasted tomatoes… so appetizing. Congratulations as well on your win! I agree that oven roasting works magic to concentrate and sweeten and bring balanced to the acidity of tomatoes. This looks like a wonderful bruschetta to try during this abundant tomato season. Love the photos! And love the recipe, too! Bruschetta is so simple to make but with fresh sweet cherry tomatoes picked from your own garden it becomes more elegant! And this is very healthy, too! Perfect for my diet for the next few weeks… I splurged over the weekend at the IFBC and I know I’m going to pay for it if I don’t get on a healthier diet. The IFBC was a lot of fun… we should plan to go together with the other Bay Area bloggers next year since it’s even more fun going with a group of friends! Thanks for sharing! Jun, that thought occurred to me, too. It would be so fun to attend next year as a group. 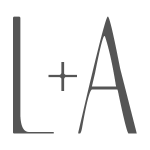 It would also be nice to do a get-together with all of us Bay Area bloggers. It would be so fun to finally meet everyone in person. Maybe before the Foodbuzz Blogger Festival. I love roasted tomatoes! I love pureeing them afterwards and canning a sauce! Yumo!